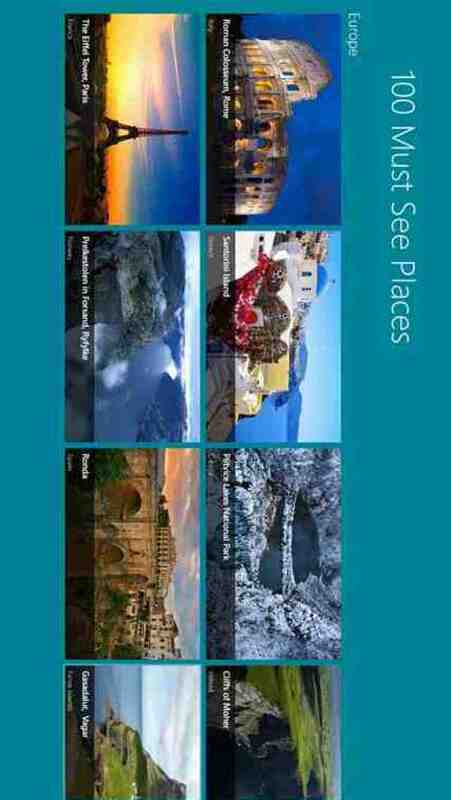 100 Must See Places - The application will introduce you to 100 must see places in the world with beautiful pictures, description about each place and an interactive map. User will have a reference to know more about the place along with a video link. The app contains features like share, search, search suggestions, secondary tile, semantic zoom. •Search Suggestions – Start typing place name in the search pane, and user will get a list of suggestions as well. Displays a maximum of 5 locations. •Save Picture- The app enables user to save pictures from the application to their device directly. •Favorite- If user likes any location and if user wants to add that particular location to favorite list then that can be done by favorite option which helps user to do this. •View Map – User can now easily navigate to any place on earth by tapping the View Map, it will navigate user to the correct location on map. •Map Types – User can have three kind of map views. They are Aerial ,Road and bird’s eye View for user experience.